Why Choose Rolfing® Structural Integration? Rolfers™ look at the body differently. We see relationships, not just individual parts. Fascia, or connective tissue, is an interconnected web which surrounds everything in the body, giving both form and support. This organ of support can be understood as a bio-tensegrity (tension + integrity) structure. The camping tent is a simple example. Both the poles and the fabric are under balanced tension -- the poles, under compressional tension, act like spacers for the fabric. Together, they create an expanded, yet stable structure. The bones of your skeleton should act like the poles in the tent -- a floating framework within the fabric of your fascia. Unlike a Roman temple, your skeleton is not a weight-bearing structure. There should be a little space between each bone -- filled with synovial fluid, bursae, cartilage or fibrocartilage. An example of a balanced expansional structure. When the fascial layers are hydrated and glide smoothly, those spaces are maintained. But adhesions and thickenings caused by repetitive stress, injury, trauma, surgery, or emotional holding form snags in the fascial web. These snags begin to compress and distort your structure like an uneven shrink wrap, pulling the skeleton out of alignment. Now, your body needs to work to stay upright rather than allowing gravity to flow through. We don't just work where it hurts. This is a primary difference between our approach and many types of bodywork you may have previously experienced. If you have a painful spot, it's a natural human reaction to massage it in order to make it feel better. We've all done that, and often it helps. But if that area is compensating for something happening elsewhere, the issue will probably reappear. Rolfing goes beyond the symptoms. One of Ida Rolf's aphorisms was, "Where you think it is, it ain't." Pain is the body's signal that something is wrong. Working on only the painful area is like shooting the messenger. The messenger is letting you know that this area is under repeated stress or overextended. The tension may be released on the massage table, but once you stand up in gravity, the area will be under strain again. "The Line" is a reference for looking at how the major segments of the body are organized in 3-dimensional space around the line of gravity. 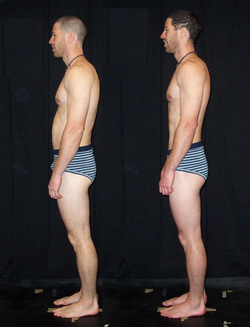 In the "after" photo of the Rolfing client, you can see how his head, shoulder girdle, ribcage, pelvis and knees are now better organized along the line. Notice how his body just looks more at ease; he doesn't need to work to stand upright. Relaxation is the ability to yield in gravity. To evoke the comprehensive changes needed to balance your structure, Rolfing is usually done in a progressive series of 10-13 sessions spaced 1-4 weeks apart. Sessions are organized around particular goals and areas of the body, involving both hands-on and movement/perceptual explorations. Together, we explore and work to release restrictions, holdings and inefficient movement patterns that are no longer serving you. As you are able to embody your line and yield to gravity, you'll begin to feel how the ground then pushes back to give you a natural lift, buoyancy and fluidity of movement. Watch a dancer or a basketball player -- their knees bend and they yield their weight into the ground before they jump. You need to be able to relax and yield in order to push and soar. Rolfing® client before and after the 10-session series. Copyright© 2016 Embodied Line All rights reserved.